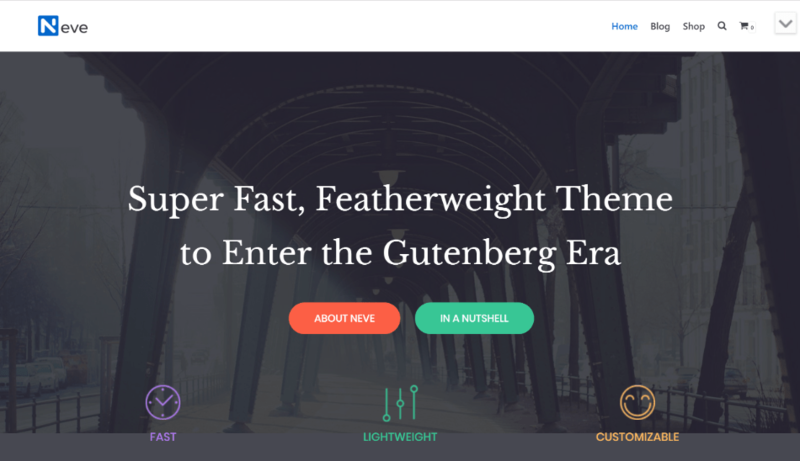 Looking for the best Gutenberg-optimized WordPress themes? In this post, we’ll share 10 great WordPress themes that are all built with the new WordPress Gutenberg block editor in mind. After postponing this major WordPress update to give everyone the necessary time to test it out, we’ve finally updated WordPress to the latest version 5.0.3 on all production instances on January 21st. What Makes for a Gutenberg-Optimized WordPress Theme, Anyway?What Makes for a Gutenberg-Optimized WordPress Theme, Anyway? As of WordPress 5.0, the Gutenberg block editor is the default editing experience for WordPress. Being the default editor implies that Gutenberg will work with any theme. You do not need a special “Gutenberg-ready theme” just to use the new block editor. However, theme developers can go above and beyond to provide extra support for Gutenberg and integrate it into their themes in more interesting ways, and that’s the type of functionality that we’re talking about in this post. Full-width image alignment – once enabled, you can make certain image blocks take up the full width of the page. In-editor styles – these let you have a more visual experience by bringing your theme’s front-end styling into the Gutenberg editor. Basically, you’ll see the same styling that your visitors will see. Default block styling – Gutenberg adds its own collection of default blocks. To create a more cohesive design experience, theme developers can add their own styling for how these blocks should be displayed on the front-end. Found a good theme? Go the extra mile. See how your new theme behaves in real life situations; we bring the numbers to you. Presslabs not only counts cache responses but also splits them by type: hit, missed or expired. Then, theme developers can also take things even further and use the Gutenberg editor to help you customize how your site looks. For example, some of the themes on this list give you pre-built demo sites which include the Gutenberg block editor, while others add their own custom blocks that are designed to help you create content that integrates into your theme. So if you want to get the most from the new Gutenberg editor, choosing one of these themes will let you take advantage of all the new functionality, plus more. Astra is a popular multipurpose WordPress theme from Brainstorm Force. Via modular functionality and detailed WordPress Customizer controls, it lets you customize its looks to match your needs. Astra also includes a variety of pre-built demo sites that you can import so that you don’t have to start from scratch, allowing you to rapidly apply it to different niches and use cases. styling for the default blocks. Some of the pre-built demo sites are actually developed using the Gutenberg block editor. That means you’ll be able to use Gutenberg to customize all the demo content to meet your needs. To tack on some extra functionality for those demo sites, Astra uses the Ultimate Addons for Gutenberg plugin from the same developer, which is built to work well with the Astra theme. 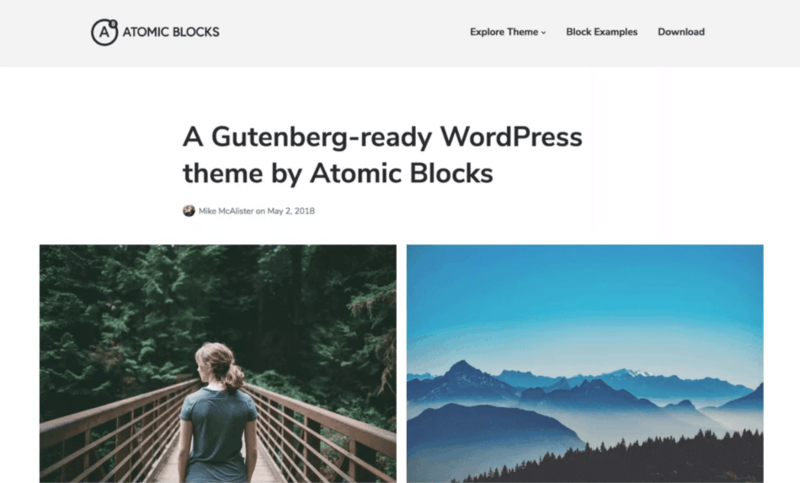 Atomic Blocks is a free minimalist WordPress theme that’s built from the ground up to work with the Gutenberg editor. Technically, it’s not just a theme. Rather, it’s a theme and plugin duo that work together to let you customize your site’s looks using the Gutenberg block editor. Then, by installing the companion Atomic Blocks plugin, you get access to a heap of new blocks, all of which are designed to look pixel-perfect in the Atomic Blocks theme. Social share icons, plus a lot more! Twenty Nineteen is the official default theme released along with the Gutenberg block editor as part of WordPress 5.0. Because the pair were released together, Twenty Nineteen is built with a special emphasis on Gutenberg-compatibility to showcase the block editor’s capabilities. With its minimalist looks, Twenty Nineteen makes a good option for writers and content creators. In the words from the theme description, Twenty Nineteen is “designed to show off the power of the block editor”. Support for the full-width image alignments. Basically, if you want something that will let you take advantage of all of Gutenberg’s default functionality, Twenty Nineteen covers all of your bases. 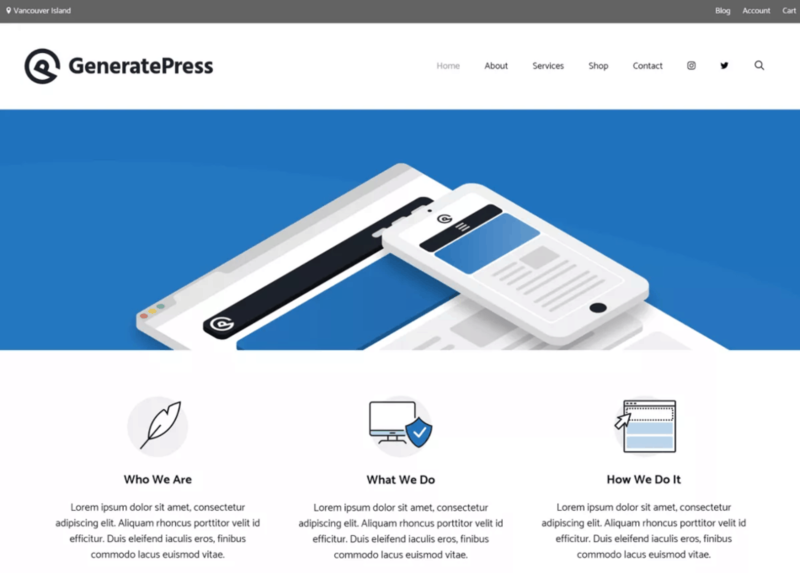 Like Astra, GeneratePress is a flexible multipurpose theme that’s designed to give you a strong base upon which you can build out any type of WordPress site. It also has deep support for the Gutenberg editor and gives you as close to a 100% visual editing experience as is possible with the new block editor. GeneratePress goes above and beyond when it comes to offering you a great Gutenberg experience. First, it has support for the basics, like the full-width image alignment and front-end styling in the editor. Then, it also goes even further, giving you a realistic content width in Gutenberg, which helps you see more clearly how the alignment of your content will look to visitors. While this seems like a small thing, it offers an enhanced Gutenberg editing experience. As time goes on, the GeneratePress team also has plans to start integrating custom Gutenberg blocks into the theme. Neve is a lightweight free WordPress theme that ThemeIsle built to coincide with the release of the Gutenberg block editor. It’s designed to provide a lightweight, multipurpose foundation that you can build upon with the Gutenberg editor or another page builder plugin. In addition to offering support for core Gutenberg functionality like front-end styling and full-width image alignments, another thing that makes Neve a Gutenberg-optimized WordPress theme is that it includes page-level controls that let you customize the canvas for your Gutenberg content. For example, you could disable the default post title and use a Gutenberg block instead. CoBlocks and Tabor are technically two separate themes from the same developer, but we’re combining them because they’re quite similar in looks and functionality. CoBlocks is free, while Tabor is a premium theme, so you can kind of think of them as a single freemium theme. Both themes have a very minimalist look that makes a great option for writers and other content creators. Style support for default Gutenberg blocks. Then, if you want to take things further, you can add in the CoBlocks plugin, which is a companion plugin that adds new content blocks, as well as a block for resizable rows and columns. The CoBlocks plugin also adds typography controls to all Gutenberg blocks (including the default ones) that give you more control over fonts and sizing for each block. Unlike many of the other Gutenberg-compatible WordPress themes on this list, GutenMag only comes in a premium version. 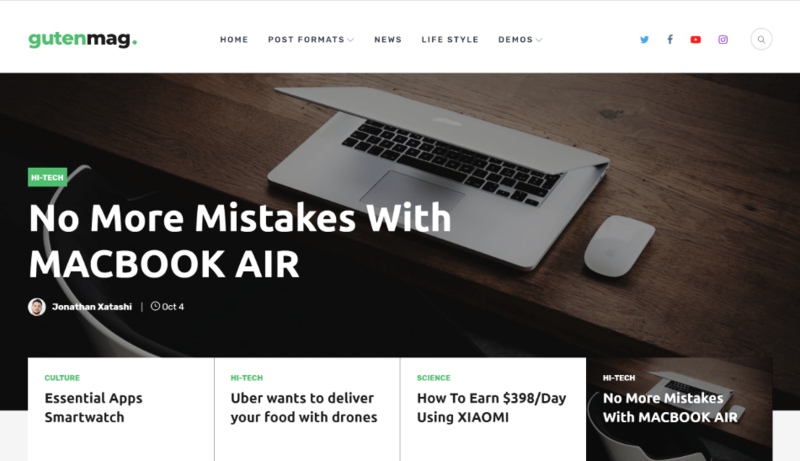 But if you’re willing to pay the $59 price tag, you’ll get a great magazine-style WordPress theme that comes with its own set of custom Gutenberg blocks. As we just mentioned, one of the ways that this theme integrates with Gutenberg is through a companion plugin that adds 12 new custom blocks to the Gutenberg editor, all of which are designed to perfectly fit into GutenMag. Front-end styles in the editor. 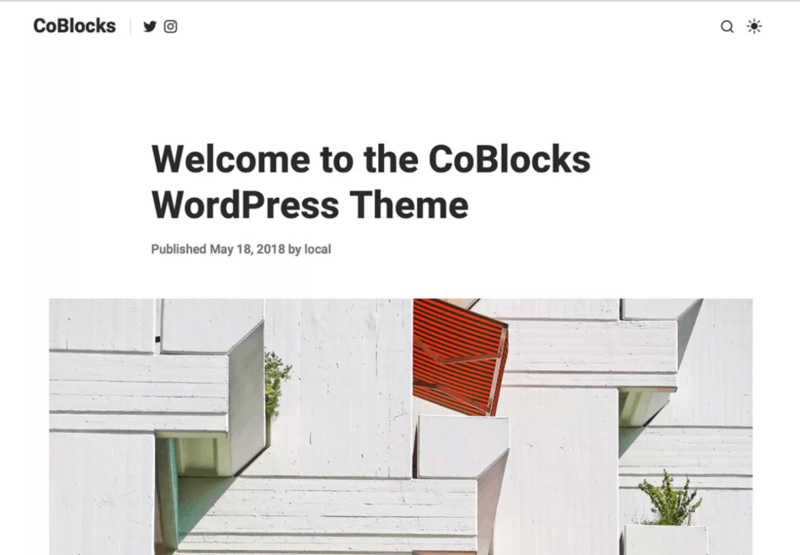 Editor Blocks is a free Gutenberg-compatible theme that approaches things similarly to the Atomic Blocks theme featured above. 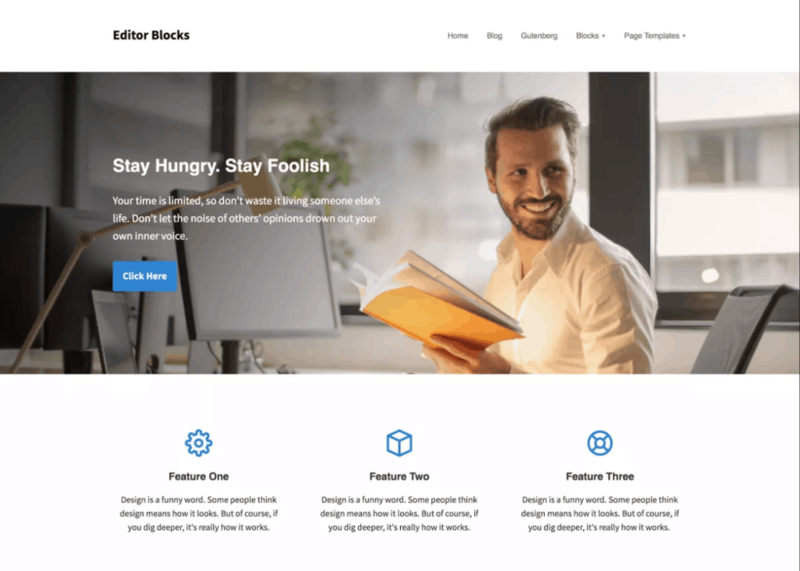 That is, it’s technically a theme and plugin combo that partner to help you create your site’s design with the Gutenberg block editor. Editor Blocks starts off with the basics, with support for Gutenberg styling and the full-width image alignment. Then, it kicks things up with the companion Editor Blocks plugin. With this plugin installed, you’ll be able to build out the layout of your site using the Gutenberg editor and the new blocks from the companion plugin, all of which are designed to immaculately integrate with the theme. For example, the demo homepage from the screenshot above is completely built with the Gutenberg block editor. 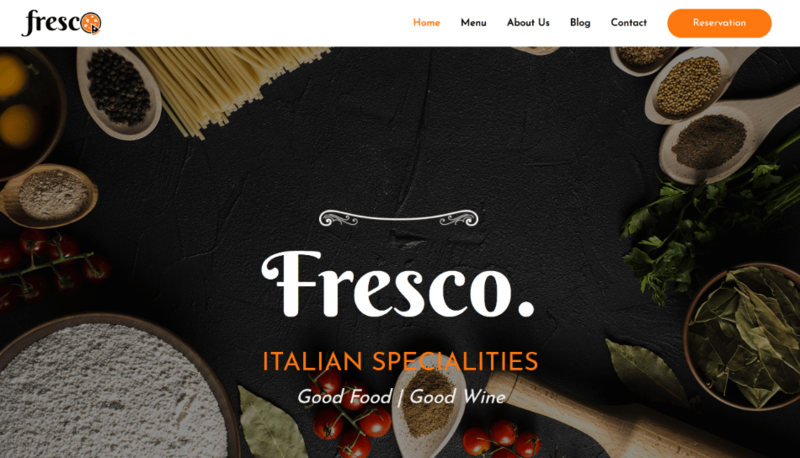 Veganos is a Gutenberg-focused WordPress theme designed for food-related sites, like recipe or foodie blogs. It has a nice minimalist look, including a strong integration with the new block editor. It’s also 100% free, which never hurts, right? As you’d expect, Veganos has all the Gutenberg-ready basics, like styling and support for full-width alignments. 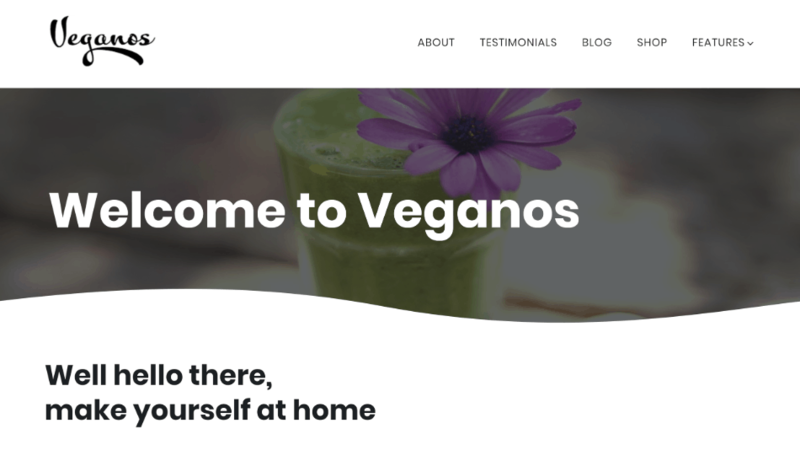 Where Veganos takes things a little further is that its demo content is built using the Gutenberg editor, meaning that you can customize how your site’s core pages look using the default block editor. For example, the custom homepage from the screenshot above is built using Gutenberg. 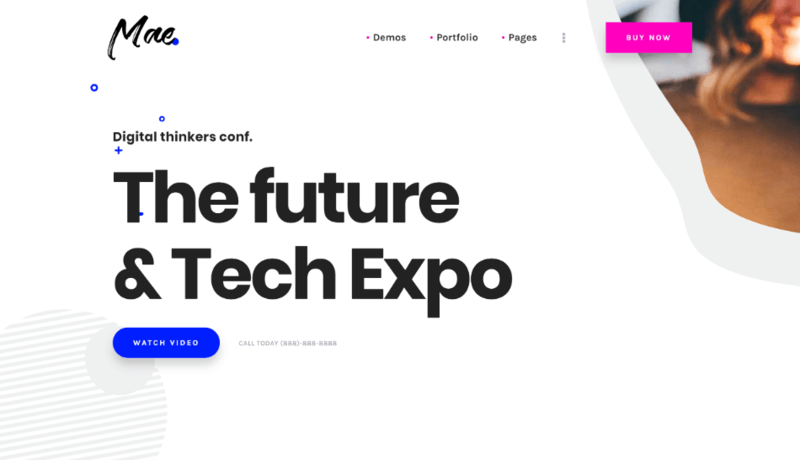 Mae is a premium Gutenberg-optimized WordPress theme built for events, conferences, and seminars. Those are definitely some niche uses. But if you are building a site that falls in those categories, you’ll be able to do it using the full power of the Gutenberg editor. In addition to the support for the core Gutenberg block editor functionality, Mae ships with 20+ custom Gutenberg blocks. Mae uses these custom blocks to build its demo content, which means that you’ll be able to customize all of the demo templates using the Gutenberg block editor. Start Enjoying the Full Power of Gutenberg Today!Start Enjoying the Full Power of Gutenberg Today! While you don’t need one of these Gutenberg-compatible WordPress themes to start using the new Gutenberg block editor, choosing one will let you experience the full possibilities for what you can do with the new WordPress Gutenberg block editor. Give one a try and build something awesome with Gutenberg!